The Chinese name for the yin-yang symbol is the “Grand Ultimate Map” (tai ji tu). As its name implies, it is a description of the changes of states in which all phenomena are expressed. Yin and Yang are categories into which the myriad things can be ascribed. The Chinese character for Yin was originally comprised of the character for the shady part of a hill, while the character for Yang included the character for the sunny part of a hill. The modern simplified characters involve the moon for yin, and the sun for yang, as they are far easier to write (at least for a westerner like me). The old characters do a great job of illustrating the concepts for categorization. The shady side of a hill relative to the sunny side is wetter, darker, cooler, lower, and the earth falls into it (gathers). The sunny side of a hill relative to the shady side is drier, brighter, hotter, higher, and the earth falls away from it (disperses). These initial descriptors do a decent job of establishing the parameters for yin-yang delineation. Though we speak of separating phenomena into yin or yang categories, it should be remembered that nothing can be a yin concept without an attending relative yang concept, and vice versa. The little circles within the greater teardrops emphasize this point. So is water always yin and fire always yang? Yes, but water can have yang aspects, such as the capacity to wear away rocks, while fire can have yin concepts, such as bending around logs. Some aspects of water are more yin than others, i.e. a still pool versus a raging river. So too are there examples of fire behaving more yang than other fire, i.e. running up a tree versus a smoldering coal. The six divisions of yin and yang are a way of distinguishing the present state of a phenomena in its expression of yin or yang. Greater Yang: This is the state of maximum yang. It is the most apparent, the zenith, and a great mover & shaker. Something in Greater Yang expression is expanding as quickly as possible. It is outward moving, expanding, and centrifugal force. In Eastern medical theory it represents what we call in English the Urinary Bladder and Small Intestine meridians and the posterior/dorsal aspect of the body. Lesser Yang: The state of yang where its actions are not as obviously yang as they are in the Greater Yang. It is the pivot, for if we use the analogy of a lever, the input of force (the handle) is Greater Yang, and the output of force (the bit moving the heavy object) is Greater Yang, for these are both sites of great action. The fulcrum/pivot point acts on the lever in a way that changes the force from one end to the other depending on the relative distance. This is a contained force that doesn’t get into the heavy object, but changes the way the input force does. 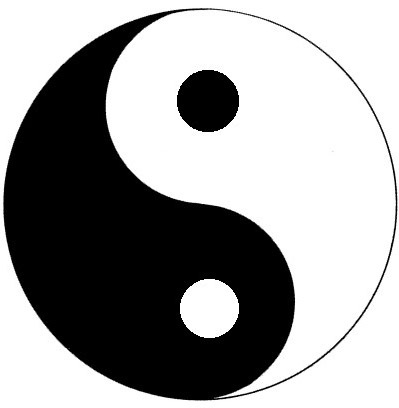 Lesser Yang is an active yang, rather than a passive yin, but its actions are obscured by the actions of Greater Yang, although they are not hidden. In Eastern Medical theory it represents the Gall Bladder and Triple Burner meridians and the lateral aspects of the body. Yang Brightness: This is Yang behaving in a Yin fashion. The Sun casts light and warmth, and is about as yang as it gets. When the full moon reflects the light of the sun, we get light (albeit reduced) but do not detect any warmth. The same can be said of the sun reflecting off the ocean, it may hurt the eyes, but we don’t particularly feel anything. Where the Greater Yang Sun moves across the sky, the Lesser Yang’s presence allows for changes, the Yang Brightness creates movement through yin concepts like contraction. In this way it is the basis/foundation of Greater Yin. It is conveyance, moving other objects, not moving itself. This is best exemplified by the intestines conducting a bolus of food, the biological force we call peristalsis. In Eastern medical theory it represents the Stomach and Large Intestine meridians, and the anterior aspect of the body. Greater Yin: This is the state of maximum yin. It is a vacuum; the vacuum of space, the lower pressure differential that draws air into the lungs. When we see yin at work in our environment we are witnessing the Greater Yin. It is obscuring like mist, dark like the deep trenches of the ocean. It is centripetal force, gathering and condensing. It is a phenomena at its nadir. In Eastern medical theory it is the Lung and Spleen/Pancreas meridians, and the most lateral of the medial aspects of the body. Lesser Yin: What lies behind the scenes. Greater Yin is the yin aspects of nature where, though invisible, we can see its effect, while Lesser Yin is the aspect of nature that remains totally hidden. In a body it is the bones, in a film it is the physical script. If Greater Yin is the vacuum, then Lesser Yin is the absolute void without a force or material presence made manifest. In Eastern medical theory it is the Heart and Kidney meridians, the most medial of the medial aspects of the body. Reverting Yin: This is the state of transition from the inward movement of yin into the outward expansion of yang. When the Universe collapses inwards on itself, condenses to a minuscule point, and then “bangs” out again, this is the action of Reverting Yin. In this way, the Reverting Yin functions as the basis/foundation of Greater Yang. In Eastern medical theory it is the Liver and Pericardium meridians.